Allow real-time customer scheduling Customers can schedule appointments on their own terms, whenever or wherever they want, without having to wait. 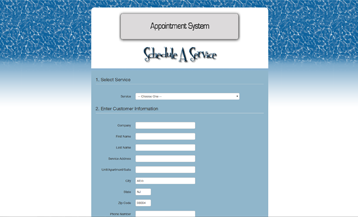 With access to your company’s schedule, customers can schedule appointments for days that work best for them, making it easier for their busy schedules. Customers receive an automatic email every time an appointment is scheduled as well as an automatic text or email the day before their appointment date. 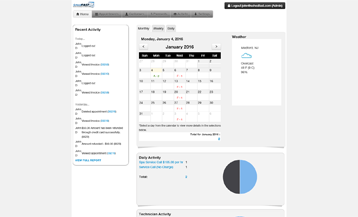 Within the SchedFAST’s backend infrastructure, the Home Page’s calendar feature lets you see how many appointments are scheduled for each day, week or month. As well as whether the appointment was scheduled online by the customer or entered in the system by one of your employees. Activity graphs When you log into SchedFAST’s backend infrastructure, you are immediately brought to your dashboard Home Page. This dashboard provides you with three visual graphs that allow you to quickly see high-level information of what is happening with your business and customers. The first graph let’s you see the total appointments that have been scheduled for a specific day. It provides you with information on the type of service being offered for those appointments as well as a way to see the full list of the appointments and the details for each. The second graph gives you a breakdown of the appointments by technician. 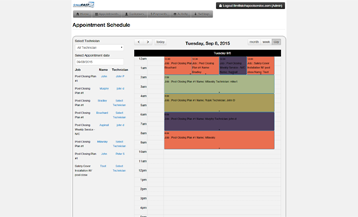 You can quickly view who is schedule for a particular day as well as view a full list of appointments that technician is scheduled for.The third graphs allows you to see all the new appointments that where scheduled for the current day. Use drag & drop to assign technicians As appointments are scheduled, you can immediately assign a technician to service the appointment. Scheduling technicians in advance can help make it easier to manage vacations or holidays. Want to wait until an appointment date gets closer before assigning a technician? No problem. 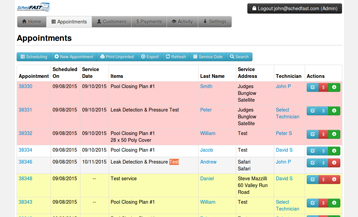 You can assign technicians right from the appointments page without having to open up each individual appointment, saving you time and allowing you to quickly move through the appointments. Color-coded activities One of the great features of the appointment list is a color coding indicator of what's happing with your appointments. You can quickly see what appointments are scheduled for tomorrow, what appointments have no service date and therefore needs attention and what appointments are past due and may need to be closed out. Unlimited bookings Within the SchedFAST’s backend infrastructure, you can specify how many appointments get booked each day by your customers. Use the limits feature to control the foot traffic on SchedFAST’s online, public portal, limiting the amount of appointments your customers can book through the site. You can update this limit at any time to accommodate customer demand.